Sorry fanboys – Apple continues to dominate Samsung in phone subscribers. iPhones were the smartphone of choice for US subscribers last quarter, with a total of 44.2% of subscriptions during the three-month period, according to new data by comScore. Samsung subscribers comprised 27% of the 191.4 million total US smartphone owners. The good news for Apple haters is that Google Android was the top smartphone platform with 51.4% of platform market share, a number that could increase thanks to Samsung's recent Samsung Galaxy Note 5 and Samsung Galaxy S6 Edge+ releases. Gartner Research revealed similar data earlier in the month. Despite launching new S6 models this quarter, Samsung's market share decreased to 21.9% compared with 26.2% during the same period in 2014. Meanwhile, Apple's market share increased to 14.6% compared with 12.2% last year. However, nearly 27% of smartphone shipments during the previous quarter of 2015 were made by the South Korean technology manufacturer, according to TrendForce data. If you're keeping count, this means Samsung sold more than 81 million of the world's 304 million devices during the three-month period. During the same period, Apple's market share declined to 16.4%, a decrease of four percentage points compared to the first quarter of the year. TrendForce predicts Apple's market share could increase up to 15 percentage points when the next generation iPhone comes out in September. This is all lining up for a very interesting fourth quarter. Apple is set to unveil new iPhones on September 9, and Samsung will continue to ship its new Galaxy devices. The popularity of each manufacturer's devices will likely determine which company held overall market share during 2015. LG held down the third spot in comScore's report, with 8.7% of overall US smartphone subscribers. Motorola was fourth-best with 4.9% market share. 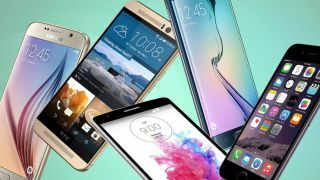 What is the best smartphone in the US?